A PA autopsy appears to the grounds for his arrest, for allegedly shooting an Arab rioter during Nakba Day unrest. A Border Police officer was arrested Tuesday after new evidence in a six-month-long investigation indicated that the officer used live fire instead of a rubber bullet, to shoot a 17-year-old Palestinian Arab rioter, Nadim Nuwara, during this past year's Nakba Day (lit. "Day of the Catastrophe," a reference to Israel's founding) demonstrations. The officer will be arraigned today at a Jerusalem court. Police investigations found that, contrary to what was originally claimed by the IDF, the rioter was not hit by a rubber bullet. An autopsy following the rioter's death revealed that the youth was killed by live fire aimed in his direction. The possibility that the rioter was killed by Arab fire from the Qalandiya region is simultaneously being investigated. Nuwara was part of a group of 150 local Arabs besieging Ofer Prison, to the north of Jerusalem. 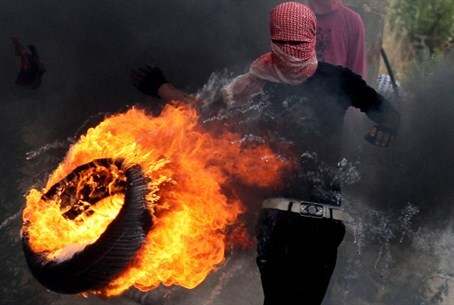 The rioters threw rocks and burning tires at police and soldiers in an apparent demand to free jailed terrorists, aside from the "Nakba" theme of demonstrating against Israel's very existence. The shooting took place after riots broke out. Police forces dispersed the rioters with various techniques. Palestinian Authority (PA) Attorney General Abdel-Ghani Al-A'wewy claimed to Reuters following last Wednesday's autopsy of Nuwara's remains, that "a fragment from a live bullet was found inside the body of the martyr," adding a live bullet "was the only reason for the death." The autopsy took place at the Palestinian Institute of Forensic Medicine in Abu Dis, just east of Jerusalem. The Judea and Samaria-based Arab Ma'an News Agency cites a source saying the head of the institute, Saber al-Aloul, led the procedure, and that a report is to be published in the coming days. Arab activists and radical leftists released a CCTV video they claimed showed the two being shot by the IDF as they walked in the area, which the IDF has brushed off as being doctored, noting that only rubber bullets were used in the riots.